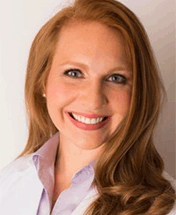 Dr. Katie Vincer Sears, an alumna of the College of Dentistry's Class of 2008, was recently recognized by the American Dental Association as one of ten "new dentists who demonstrate excellence in their work, their community, and by inspiring others." Commenting on her selection as an award winner, Dr. Sears said, " Being recognized among the ADA's '10 Under 10' is both exciting and humbling. At my practice, Scarlet Dental, I have proudly chosen to focus on treating the underserved -- those patients who are on Medicaid and managed care plans." Selected by the ADA's New Dentist Committee from more than 200 nominations, the "10 Under 10" winners showcase the personal and professional successes of dentists who have practiced for less than ten years. Nominees and winners were required to be ADA members who graduated between the years of 2008 and 2017.